How is my chair shipped? The chair I want can't be shipped via FedEx Ground. How is it shipped? How long does it take to receive my chair? Can I purchase with GSA contract pricing? How is a restocking charge good for me? Why are your prices better than ANYWHERE else? How can I be sure my order is accurate? How can I be sure my order is privacy secured? After you have added your Chair(s) into the shopping cart simply click the Check Out button, specify your shipping destination then a final quote for your order including the shipping and handling cost, will be provided. Chairs that can not be delivered via FedEx Ground must be shipped via a common freight carrier (truck). Please note that common carrier (freight) shipments must be carefully inspected and any damage noted on the freight bill at time of receipt. If you select a standard fabric, your chair will generally be shipped within five (5) business days, however, the lead time is dependent upon the options you have selected. Yes. CHAIRCONSULTANTS.COM has negotiated reduced rates with international carriers. Please contact CHAIRCONSULTANTS.COM TOLL-FREE (866) 937-6472 for specific quotes. Yes. CHAIRCONSULTANTS.COM has negotiated reduced rates with freight carriers. Chairs able to be shipped via FedEx Ground can be shipped to Alaska or Hawaii but require additional shipping charges. Regarding chairs not able to be shipped via FedEx Ground, please contact CHAIRCONSULTANTS.COM for specific quotes. Of course! CHAIRCONSULTANTS.COM will accept purchase orders, without prior credit approval, from public agencies and many well-known or established companies. The actual purchase order must be faxed to 818-865-8808 before the order will be processed. Commercial organizations wanting to issue a purchase order with open terms should contact a CHAIRCONSULTANTS.COM representative for prior credit approval. Please see below for corporate account information. Commercial organizations interested in establishing CHAIRCONSULTANTS.COM as their BodyBilt chair vendor are welcome to inquire about setting up a corporate account. Please contact a CHAIRCONSULTANTS.COM representative for additional details. First-time purchases must be paid by company check or credit card. CHAIRCONSULTANTS.COM is an authorized dealer for GSA contract pricing. Please call TOLL-FREE (866) 937-6472 for GSA pricing. New or Like New Items may be returned for replacement or refund within thirty (30) days from the invoice date. After thirty (30) days, any return (if possible) must be made directly to the manufacturer. All chairs sold on CHAIRCONSULTANTS.COM are built to your custom specifications. You will have a risk free 30 day trial period. All refunds for new or like new (non-defective) items exclude shipping and handling charges. If you received 'free shipping' with your order, the price of shipping was added to the price of the item. Actual shipping charges are not refundable. Please call (866) 937-6472 to receive a Return Authorization Number before returning any items. In some extraneous cases, non-defective items being returned for refund will be subject to a twenty-five percent (25%) restocking charge. Prior to delivery, special order items may be subject to a ten percent (10%) order cancellation penalty. Defective items must be replaced with identical product. In order to receive a refund, item(s) must be returned with shipping pre-paid. All items must be in "as-new" condition, in original packaging, and with all warranty cards, manuals, and accessories. If returned items fail to meet these requirements, any request for replacement or refund will be denied and the original items will be returned to Customer. All returns must be sent via UPS, Federal Express, or any other method in which the parcel is able to be traced. CUSTOMER IS RESPONSIBLE FOR GOODS BEING RETURNED UNTIL ERGONOMICALLY CORRECT RECEIVES SUCH GOODS. CUSTOMER IS RESPONSIBLE FOR ALL SHIPPING, HANDLING, AND INSURANCE CHARGES. THIS RETURN POLICY IS NOT A WARRANTY. ERGONOMICALLY CORRECT. RESERVES THE RIGHT TO CHANGE OR CANCEL THIS RETURN POLICY AT ANY TIME BEFORE ACCEPTING CUSTOMER'S ORDER. When customers know a restocking charge applies to their order, much more care is exercised to ensure they are ordering the correct item. By keeping our product returns and re-orders to a minimum, CHAIRCONSULTANTS.COM is able to offer you lower pricing and better overall value. 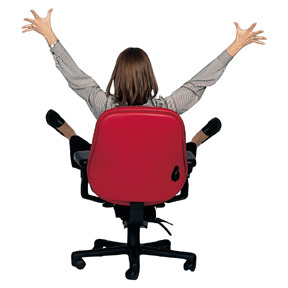 CHAIRCONSULTANTS is a subsidiary of Ergonomically Correct based in Chatsworth, CA. Our entire staff consists of Certified Ergonomic Assessment Specialists with extensive chair consultant training. We are an authorized dealership for all the products we sell. We have minimal overhead and share our cost savings with our customers. No. CHAIRCONSULTANTS.COM does not sell any contact information to any third parties. We encourage you to request a swatch for approval prior to placing your order. To request your swatch(es) please use our 'contact us' form and request fabric cards. Overstocks of chairs, or floor models are sold at inventory closeout prices. CHAIRCONSULTANTS.COM accepts Visa, Mastercard, and American Express credit cards. Of course, you can also send a check or money order. When sending a check (including company checks), orders are not processed until funds have cleared. How can I be sure my online order is accurate? Due to the complex nature of the numerous options available on your chair, CHAIRCONSULTANTS.COM is currently electing to manually review most orders prior to processing credit card information. In addition, a CHAIRCONSULTANTS.COM representative may need phone verification prior to processing your order. How can I be sure my online order is privacy secured? At CHAIRCONSULTANTS.COM we've taken extensive precautions to protect you while shopping with us, so you never have to worry about credit card safety. Our secure server software (SSL) is the industry standard and among the best software today for secure commerce transactions. It encrypts all of your personal information, including credit card number, name and address, so that it cannot be read as the information travels over the Internet. If you still do not wish to use your credit card on the Internet, no problem! Just phone our Customer Service Line TOLL-FREE (866) 937-6472. SpineAlign�- the chair for everyone else.